*Subject to change without notice. © 2019 S. Botello Productions™ All rights reserved. *Schedule subject to change without notice. © 2019 S. Botello Productions™ All rights reserved. Short Films Screening 29 short films shot with smartphones. Filmmakers from around the world share their films during #MFF2019SanDiego. 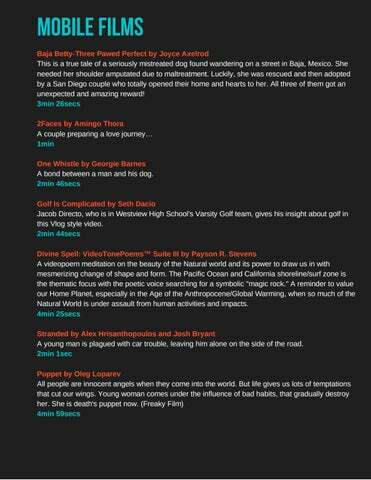 Feature Film Consensus Reality is a full feature length film by Steve Peterson. Shot with an Android Smartphone. Feature Film Mad House is a full feature length film by Ross Perkins. Shot with an iPhone. Special Guest Speakers About John Woosley (Writer/Director, Alex & The Firefly)John has been making films for over ten years and holds a degree in Film & Theater from The University of Kansas. While attending, John studied with Kevin Willmott (Writer, BlacKkKlansman) and directed his debut feature Angel of Music. John Woosley from Missouri will present his film, Alex & The Firefly. John will present a mobile filmmaking workshop seminar where you can learn how to make a movie using your smartphone. He will discuss how to get started and move you along to the production of your movie. Learn the tools and gear that will help you shoot higher quality films, including some useful apps for filming and editing. A very powerful presentation. *See schedule for date and time. About CK Goldiing CK is a content creator and the founder of Icons & Machines Agency based in the UK. CK Goldiing from the United Kingdom will present his film, 61 Hugs and a moving and inspiring story. “Crippled by a lifetime of overthinking, CK is a typical artist – forever worried about rejection, people’s perceptions and how things look. One day, he is challenged to leave his house, walk the busy streets, and ask sixty-one strangers for a hug. Although terrified by the inevitable rejections ahead, CK accepts, clinging to his long-standing belief that ‘overthinking is the enemy of remarkable’. Filmed in one take using actual footage from the challenge, ’61 Hugs’ demonstrates the remarkable power of optimism, heart, goodwill, human spirit, spontaneity and the universe.” — 61 Hugs *See schedule for date and time. 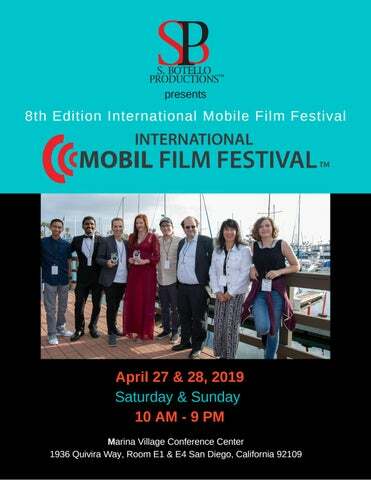 A short presentation by Global Mobile Film Awards™ with Matteo Tibiletti flying into San Diego from Italy for the International Mobile Film Festival. Matteo won the 2018 Best Experimental Film Award. He will present an Honorary GMFA Award to one attending filmmaker from the short film competition. 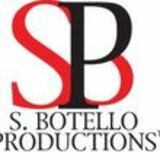 A brief history of the programs by S. Botello Productionsâ&#x201E;˘. SBP was established in July 2006. Based in California, SBP was active as a professional media production company providing services to organizations, individuals and companies. Founded by Susan Botello from San Diego, it provided graphic design, video production and some independent film work. Susan's professional experience began in 1998 beginning with a local video production company. The idea of the International Mobile Media Film Festival began with a vision after September 11 that began to conceptualize in 2003. In 2004, the idea of a film festival was postponed because Susan wanted the festival to not be a website but a traditional festival. In 2009, the festival was officially launched publicly with other programs in mind to support it. The Mobile Film School was conceptualized at around the same time of the festival. However, SBP waited until the first festival took place to announce it during the inaugural festival and held it's first workshop during IMFF2012. Mobile Film School officially launched in September 2012 with two collaborative partners in the mobile film industry. It has since provided a number of workshops, master classes and a mobile filmmaking bootcamp. It also hosts workshops during each film festival. As more and more films shot with smartphones accumulated awards in different film festivals, including non-exclusive mobile film festivals, the Global Mobile Film Awardsâ&#x201E;˘ was designed to provide films which had won awards an exclusive opportunity to win annual best of the best awards in an Award Ceremony which has been dubbed, The Oscars of mobile film. GMFA is not a festival. It is an online award with mobile and non-mobile film festival members providing the opportunity to awardwinning films. SBP Podcast is The Voice Of Mobile Filmâ&#x201E;˘ for everyone who ever wanted to or is curious about making movies and videos using smartphones. It launched in October 2017. It mostly publishes a roughly one hour long episode once a week with a guest. As we celebrate 10 years in the mobile film industry, we have come to make many friends all over the world who appreciate what we do. Many filmmakers who attend and/or participate in our film festivals, mobile film events, workshops have become part of a global growing community. We decided to create a hashtag: #MobililzeStories to help them receive support online by others and us. But we also wanted to create a monthly themed smartphone video contest and local events where people can attend locally, connect, learn, share and support each other. A little mingling too. 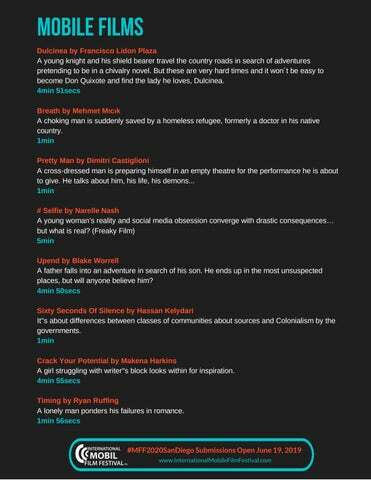 MobilizeStories is a mobile film community network. © 2019 S. Botello Productions™ All rights reserved. © 2019 S. Botello Productions™. All rights reserved. All films were shot with smartphones. Meet some of the filmmakers in person. All the films were shot with Smartphones. Meet some of the filmmakers in person. International Mobile Film Festival 8th Edition Day One Program Schedule. 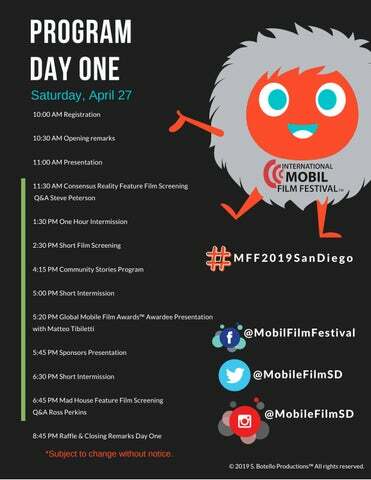 #MFF2019SanDiego San Diego International Film Festival where all films are shot with smartphones. 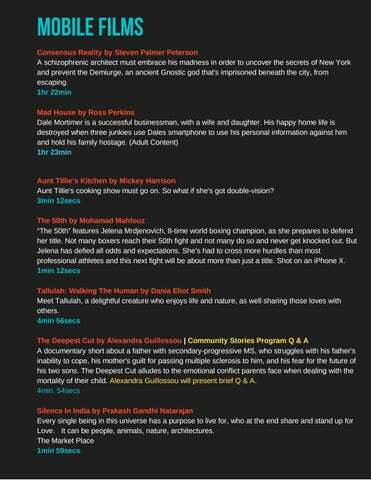 Short Mobile Films and Feature Mobile Films screening. Meet the filmmakers. International Mobile Film Festival 8th Edition Day Two. 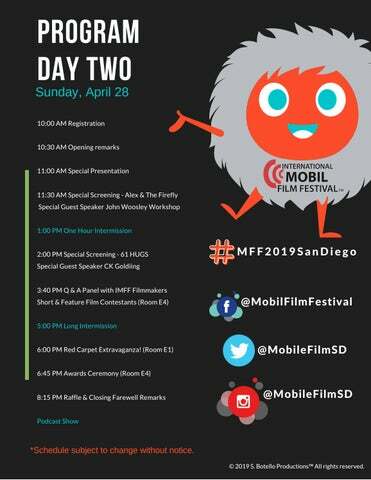 San Diego International Film Festival only for films shot with smartphones #MFF2019SanDiego. Guest Speakers, Presentations, Mobile Filmmaking Workshop Seminar, Q & A Sessions, Q & A Panel with global filmmakers who all shot their films with smartphone cameras. The Red Carpet Extravaganza! Awards Ceremony.